President Kennedy addresses concerned students gathered on the Dexter Library lawn on May 4, 1970. Earlier that day at Kent State University in Ohio, National Guardsmen had opened fire, leaving four students dead, one permanently paralyzed, and eight others wounded. Then-Gov. Ronald Reagan closed most California public universities and colleges in the aftermath of the invasion of Cambodia and the Kent State killings, but Cal Poly was able to remain open. In fall quarter 2016, first-year students in Professor Molly Loberg’s History 100 course were given one parameter for their first assignment: research the 1960s and 1970s at Cal Poly using historic records uncovered in the University Archives. During those two decades, Cal Poly experienced an unprecedented rate of change, growing from 6,000 students in 1960 to 16,000 by 1980. After having been excluded since 1930, women were allowed to return as students in 1957. The passage of the California Master Plan for Higher Education in 1960 led Cal Poly to join the California State College system (now the California State University). The Pomona campus separated from Cal Poly in 1966, the same year president Robert E. Kennedy succeeded longtime president Julian McPhee . The History 100 students used a range of primary sources from the University Archives, including the student newspaper, yearbooks, course catalogs, and records created by students, staff, faculty and presidents. They analyzed Vietnam War protests, the impact of the Civil Rights Movement, and the university administration’s stance on the rights of women and minorities. They examined the establishment of organizations representing the diversity of students at Cal Poly, including the Black Student Union, the United Mexican American Students, the Gay Student Union, and Students for New Action Politics. They also explored student and faculty responses to the Diablo Canyon Power Plant in the 1970s, organizations that formed to protect victims of sexual assault, the impact of alcohol on campus, and the musical groups that performed on campus. Read excerpts from student research below, along with the primary sources they uncovered. Do you have your own history to share? Do you have questions to ask the archivists or History 100 students? Submit your information to University Archives or email your question to magazine@calpoly.edu. Students gather in front of Mott Gym to protest the suspension of students, 1963. “In October 1963, four female students from Cal Poly were suspended as a result of being present at an extracurricular barbecue located at a fraternity house off campus. This incident posed an important question of whether the college administration’s interpretation of their responsibilities in loco parentis (in the place of a parent) created tension with the student body. Evidence shows how the student body challenged the policy through campus protests, an ASI report to the dean of students, and meeting minutes of the Student Affairs Council.” Ecal finds that their efforts would ultimately push the administration to change their policies of women students. An interview with President Kennedy, part of a special issue of the Mustang Daily published for Kennedy’s inauguration ceremony. Read the full issue here. “When Robert E. Kennedy was appointed president of Cal Poly in 1968, one of his main goals was to transition from a centralized to a more decentralized, democratic form of administration. 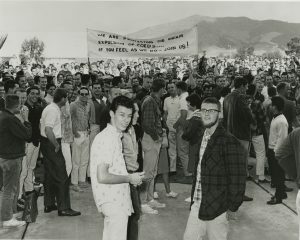 While his predecessor, President McPhee, favored the former, Kennedy believed that spreading responsibility among specialized committees and involving all affected parties in the decision-making process was the only viable option for such a fast-growing school.” Barr identifies one event in particular that showed how Cal Poly’s unique administrative policy significantly affected student-faculty relations — the Dow Chemical protest in 1968. Based on Kennedy’s own accounts and student newspapers from the time, Barr argues that Kennedy’s “overlapping, group-participation” approach to governing fostered a sense of cooperation and respect between students and the administration that would be essential in maintaining relative order during the turbulent Vietnam years. Aerial view of campus in 1961, looking east toward the Poly P. The photograph captures the construction of Engineering West, the Dexter Library addition, the Graphic Communication Building, and the English Building. 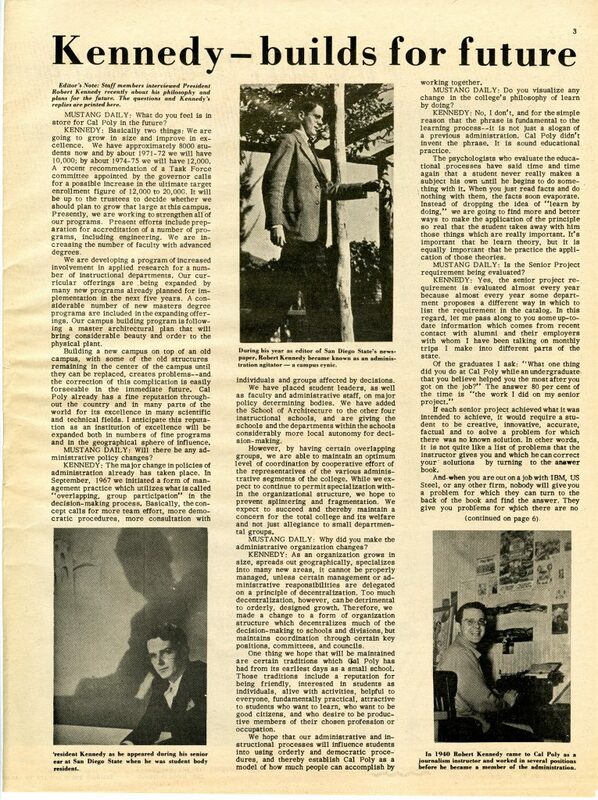 Sheets used the student newspaper to interpret how college students at Cal Poly felt about their future in the 1960s, the same decade of the Vietnam War and Cuban Missile Crisis. 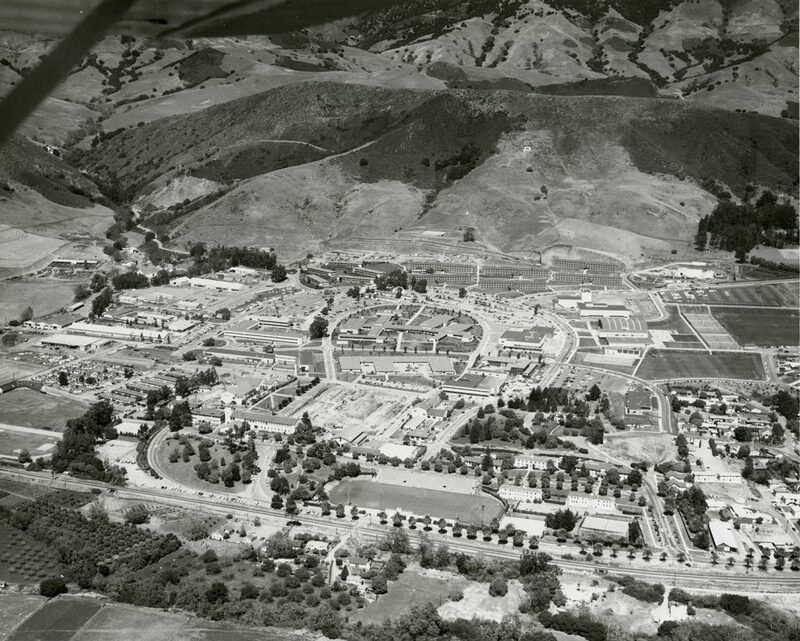 “Thanks to peaceful protests, numerous job opportunities, and an expanding campus, Cal Poly students had an optimistic view of their future in the 1960s.” The fact that highly successful firms were visiting campus to recruit graduates and the extraordinary growth of campus — new science and computer buildings, dorms, and a proposed library and college union — all were sources of optimism for students at Cal Poly.